With the upcoming long weekend, I'll be headed home to see family & friends I haven't seen for a while. I needed to come armed with gifts, and scoured the Internet for ideas. Home made presents are always extra thoughtful, and usually more fun for the gift receiver as well as the gift giver, not to mention great when you're on a budget. I stumbled across this DIY from Martha Stewart, and knew immediately I could make a fun, personalized version for my friends. 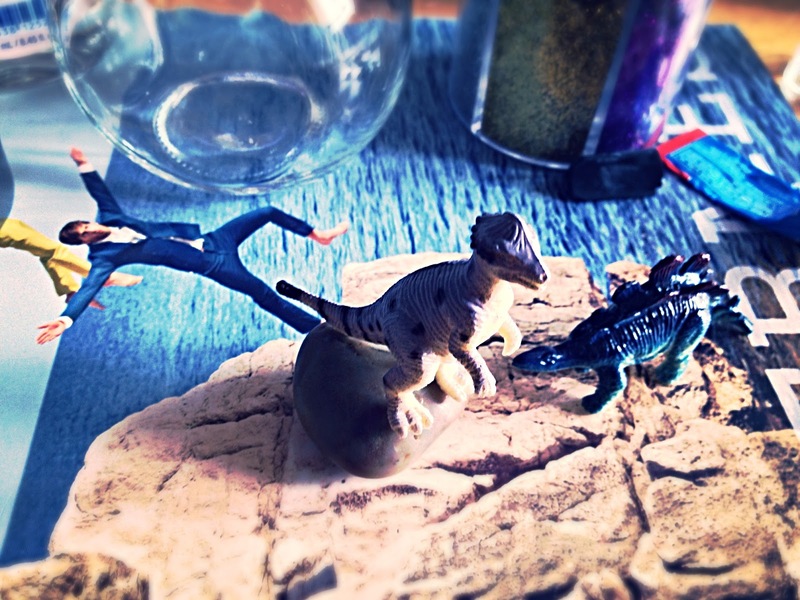 Instead of Christmas trees, I used fun plastic dinosaurs & animals. Everything used here was purchased at Dollarama, and it was super easy! I highly recommend trying this yourself for a super fun & unique gift for a loved one. This is a great project for kids as well! 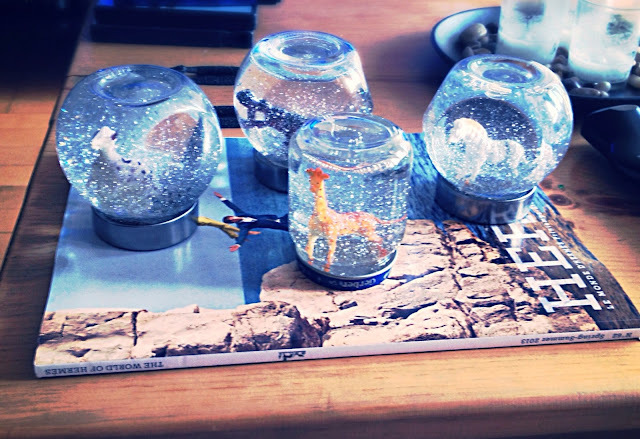 Instructions on how to make your Dino Snowglobe, after the jump! First off, pick your figure. This is going to be the main focus of your snow globe, so make sure you pick wisely. My girlfriend loves dinosaurs, so I went with this cute dino. You also need to make sure the figure isn't too wide, as it needs to be able to squeeze through the opening of the jar. Because I wanted my dinosaur to stand higher in the snow globe, I decided first to glue it to a small rock for a base. Plus, it looked cute. 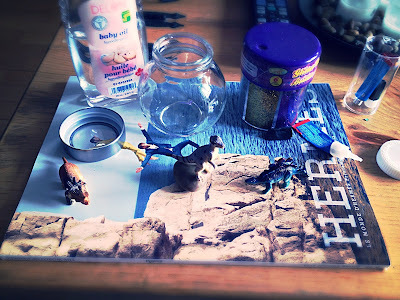 After you have glued your dino to your rock, give the glue time to dry to make sure it is secure. Do not be afraid to get lots of glue on those feet! 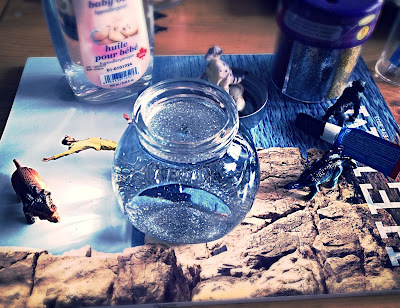 Once you have your base, you now need to glue the base of the rock, to the inside of the jar lid. Before adding the glue, make sure to test out your dino placement, so that when the jar is closed, your dino will be facing the direction you want it to. Once glued, again let it dry. While you're waiting on your lid to dry, now it's time to add the baby oil to the jar. You want to fill the jar as close to the top as possible, leaving only a small amount of room for overflow (less than half an inch). Once you're finished adding the oil, now pour some glitter on there! I find silver glitter to be extra dreamy. 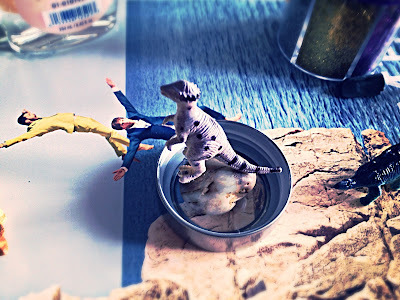 Last but not least, rim the inside of your jar lid (or the outside rim of the top of the jar) with crazy glue, and carefully slide your dino inside and close the jar as tight as possible. Voila! 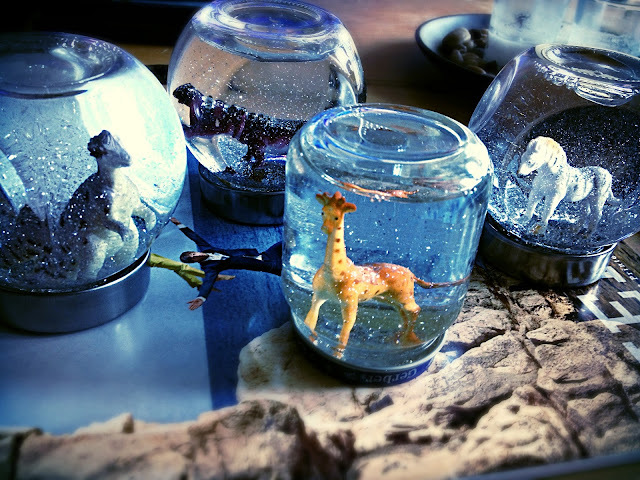 Dino Snowglobe!